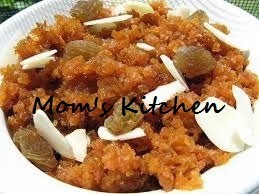 Here comes another but different Halwa straight from my mom's kitchen.... This time Sweet Potato Halwa. A low calorie dessert for my diet conscious viewers. Clean and wash sweet potatoes and pressure-cook them for 4 to 5 whistles or microwave on high for 5 to 7 minutes. Peel them , mash and keep them aside. Heat the oil in a non-stick pan and add the mashed sweet potatoes and saute for 2 to 3 minutes. Add the milk, ½ cup water, sugar and cardamom powder and simmer for 1 to 2 minutes ensuring that the mixture has little liquid remaining and not completely dry. Add the saffron and nuts and mix well.